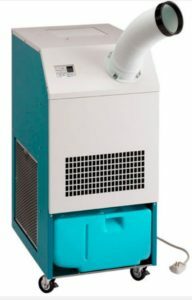 The Classic 10 is MovinCool’s original portable room air conditioner. Its rugged design features a standard 115 V source, which can handle temperatures up to 105 degrees Fahrenheit. Among portable AC units, the Classic 10 has continued to hold its own in the industry. Since the Classic 10 spot cooler is self-contained, portable and has no special power requirements, it can be rolled into any room to instantly cool the hottest spot. The Classic 10 redefines portable cooling by efficiently cooling only the area that needs it. This saves you money while protecting people and equipment and speeding up processes. Commercial and industrial air conditioning hasn’t been the same since 1982!